Okay technically it’s not from magic cows, it’s milk from normal cows – but they are cows specially chosen by a DNA test using tail hair which I think is pretty magical. ‘Hey Joe, what do you do for a living? ‘ ‘I comb the tails of cows and see if they make milk without that protein that upsets people.’ But I’m right in saying it might beat bloat – and other nasty dairy related symptoms – in some people. Why Is A2 Milk Special? Most milk contains two slightly different types of a protein called beta-casein – which have (rather boringly for writers) been named A1 and A2 – and it’s been suggested that some people have trouble digesting A1. The reason is that when it’s digested it causes the release of a peptide which has been shown to cause digestive problems in animals – and supposition is it does it in humans too. Yes for years lactose has been getting all the bad press as to why drinking milk triggers bloating, wind and sudden runs to the bathroom – but it might not be the culprit. Some people might actually only have issues digesting A1. This might explain why so many people who swear blind they can’t drink milk because it upsets them don’t have a positive result when they are tested for lactose intolerance. Lactose isn’t their problem. You’ve guessed what’s coming here haven’t you – A2 milk doesn’t contain any A1 protein. It comes from cows whose genetic make up doesn’t allow them to make it (hence the DNA tail test to find them). Now I do admit, there’s a lot of experts who say this is puffery – that there’s no evidence that this particular peptide causes problems. There’s also however a whole heap of people in Australia where the milk has been sale for a few years now whose bellies and bowels disagree. A major trial that’s directly investigating what happens in the body’s of people who drink A2 milk is being conducted now in Australia and it’ll make very interesting reading when it reports. Until then though the proof is in the drinking. 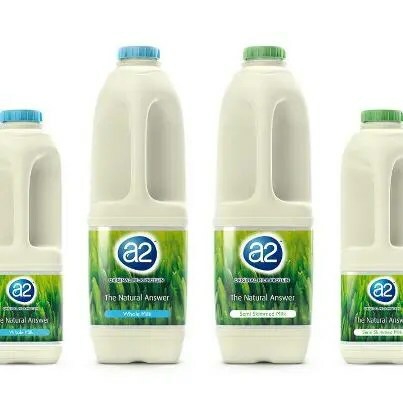 A2 milk has just launched in the UK (Aussie readers can now stop wondering why I’ve writing about a product that’s been on the shelf for ages) and it tastes pretty good (not surprising really as it’s effectively normal milk). I don’t have any issues digesting dairy so I can’t report back on the health effects personally I’m afraid, but at about £2.00 a bottle it’s not going to break the bank if you do have problems and you want to try it. After all with milk being a major source of calcium, protein and other nutrients, if you don’t need to quit it then you probably shouldn’t. It’s out now in Tesco and Morrisons. Do note though, A2 milk is not suitable for anyone with diagnosed milk allergy or lactose intolerance. The ingredients that cause these are still in the product. Yesterday I told you about my plan for NO-vember and promised that every day I’d give you a list of things I said no to that day. So, here they are…. The chocolate bar I eat at the hairdressers. I HATE having my hair done, but as a non natural blonde it has to occur every 6 weeks. I’d got into the habit of buying a KitKat Chunky (Peanut Butter) on the way there to numb the trauma – but yesterday, I said no. The large size wine in the pub. I went 175ml. All dinners on the menu with chips! Things I should have said no to and that I need to work on. The garlic bread I ordered with my fish pie and cabbage just because we had a 25% off voucher so it was free thereby cancelling out the lack of chips. The Turkish Delight Thin I had when I got home because I didn’t have dessert. This is despite the fact that we never normally have dessert when eating out! I blame the third wine.